Observations: Pashmina is a wonderful and colorful rendition of growing up Indian-American, with all the cultural baggage (sometimes literal baggage) that entails. Children of immigrants in particular will see a lot they recognize here, and those who aren’t children of immigrants will catch a vivid glimpse of what it’s like to have that relationship with the “old country,” its traditions and religion and even cultural mores. 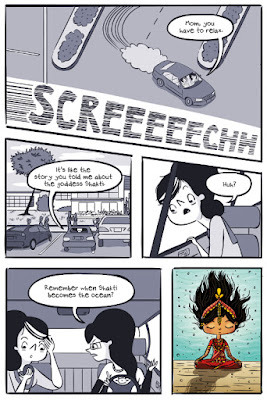 The shock of what it’s like to visit India for the first time is also nicely rendered. The book is nicely pitched to appeal to a wide range of ages. 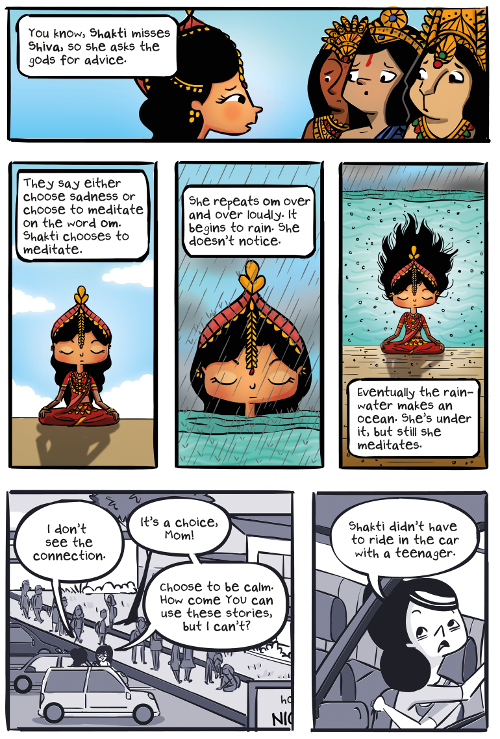 The cute animal characters in the world revealed by Priyanka’s shawl are adorable and mysterious, and the elements of darkness in this tale are thought-provoking without being scary. 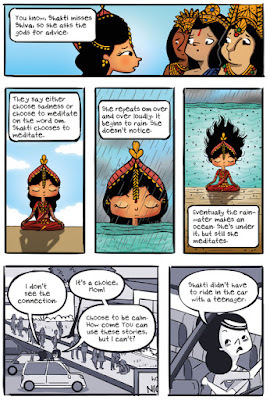 I loved the deceptively simple, appealing style of the artwork, too. The drawings of places in India contrasted well with America, and the images were easy to read. In terms of the language used, the use of Hindi and “Hinglish” was really well done, and provides not just a particular “flavor” for non-Indian readers but is accurate and recognizable for those American-Born Confused Desis among us. The glossary is a great addition, too, although the visuals make it possible to figure out vocabulary from context. Conclusion: This is one of those books I wanted to hug (but I couldn’t, because it was a digital review copy!). There still aren’t enough stories about and/or featuring 2nd-generation Indian-Americans—it’s such a complex and multilayered and varied experience—so I was happy to see one that not only covers the topic an a thought-provoking and satisfying way, but also doesn’t limit itself to being a particular “type” of story. 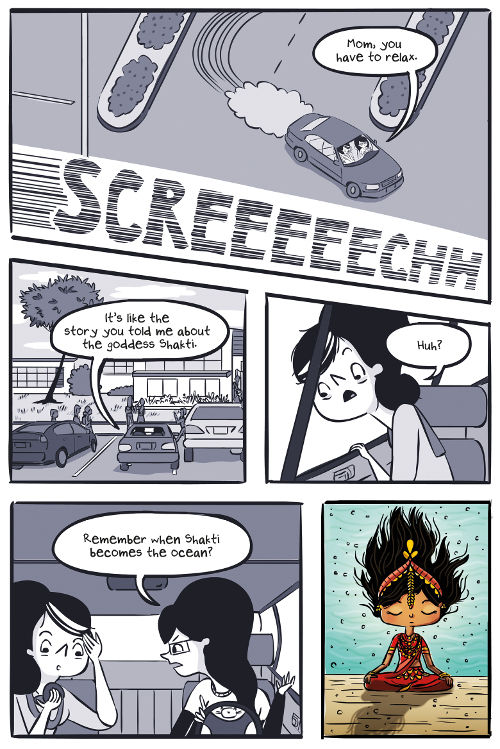 (Priyanka draws comics, and has an identity that isn’t just about being South Asian.) I look forward to seeing more from this author! I received my copy of this book courtesy of the publisher for Cybils. 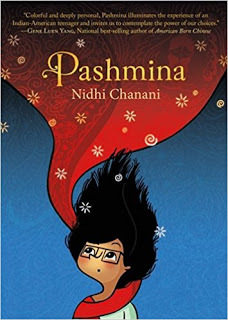 You can find PASHMINA by Nidhi Chanani at an online e-tailer, or at a real life, independent bookstore near you!